If you haven't slept yet, well here's more reason to wake up early. 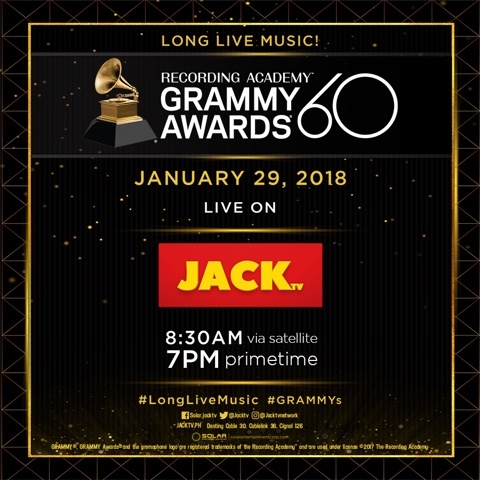 Tomorrow January 29 at 8:30AM in the Philippines, the 60th Grammy Awards is going to be broadcasted via sattelite at everybody's favorite crazy network, JackTV. Hosting the show is crazy person, James Corden and I think he'll be doing some carpool karaoke. Though I'm excited to see who will win in some of the categories. As we know, we'll probably see some bits of Despacito, Jay-Z, Lorde, Bruno Mars and a lot of others. If they perform though that will be another story, because I heard Kesha, Lady Gaga, Elton John, Miley Cyrus, Sam Smith, and the whole parade of artists that would really be nice to see on this Cable channel. It starts 4:30PM Pacific so that's 8:30AM Manila time with all the red carpet premieres in between that will probably shock you because it's their 60th of course.